For assistance from any librarian via phone, email, or chat ... Ask Us! For subject specific assistance ...check out our Research Guides by Subject. Find a tutorial to help answer you questions. For technical help accessing online resources...email erhelp@uncg.edu or call 336.334.5419. Check out some troubleshooting tips first! For technical help with email, ID, PIN, or Canvas ...contact the UNCG "6-TECH" Online Service Portal or call 336.256.TECH. Search the library's Online Catalog. You can search by author, title, subject or keyword and other parameters. (UNCG Libraries has a Worldcat Discovery guide with resources and tutorials on how to use UNCG Libraries catalog.) The location of materials chart will help you locate the part of the building that holds your book. Get a book the library does not own? Fill out an Interlibrary Loan request form by logging in with your UNCG login and password and click on Request a Loan from the left side menu. You will be notified via email when the book is available to be picked up at the library usually in about 5-10 days. For students registered as DISTANCE students outside of Guilford County - we will mail you books from our collection to you, free of charge, with a prepaid label to return them. Fill out an Interlibrary Loan request form by logging in with your UNCG login and password and click on Request a Loan from the left side menu - just as you would for ordering a book from another library. Make a note in the "notes" box that you are a Distance Student to make it easier for our ILL staff to undestand the request. Check out the Distance & Online Learning Guide for more info if you are a distance student. Journal and newspaper articles can be found in our online catalog, as well as simply finding the titles of journals. To search in our online catalog, do a search and then limited by format on the left side; you can even limit which databases to search under the Advanced Search. Find more help here. But one of the most effective ways to find an articles you need though is to search a database. The library subscribes to over 400 electronic databases which index various journals and their articles, many with full text available online. Try the subject guides if you are not sure where to start - or click on the "Library Resources" tab in Canvas for library resources for your course or major! Find full text of an article from a citation? If you can't find the full text of an article in the database you are searching, try the Journal A-Z list (located under the red search box) to see if immediate online access is available through other means. Type in the journal name and you will get a list all places this journal is indexed. Note the range of dates for the journal and starting/ending dates of the full text availability. Request it through our Interlibrary Loan request form. Login with your UNCG username and password and click on Request a Journal Article from the left side menu. It takes 2-10 days to deliver; it will be emailed to you. Many library databases contain scholarly articles. When searching in a database, look for a filter (usually on the left) you can select to provide only scholarly/peer-reviewed results (not available in all databases). For more information on determining the difference between scholarly and popular articles check out this library help sheet. Try our research guides by subject to find databases, e-resources, and course specific guides related to your topic. A subject specialist librarian will also be listed here if you need help or have questions related to that subject area. Whether is APA, MLA, or another required style, this citation guide will assist you in creating your bibliography/works cited page for your research paper. To learn more about citations, go through UNCG Libraries Path tutorial's Module 10: Citing Sources. Citing your sources helps avoid plagiarism. For eReserves, log into Canvas using your UNCG account and password. eReserves should be integrated into your course assignments OR located in the Files section of your course. Print Reserves can only be used within the library. Time limits will vary - you will be told at the time of use. Find study space in the library? You can find information about study spaces from the Library Spaces webpage. Laptops, iPads, camcorders, voice recorders, digital cameras, microphones and tripods are available for checkout in Jackson Library and Harold Schiffman Music Library. Flipcams, graphing/scientific/financial calculators, and portable DVD players are also available in Jackson Library. Technology is loaned on a first-come, first-served basis. Note: our laptops only work when connected to the UNCG AD/GCN network; they do not work off-campus. See our Technology Checkout page for additional details. You may suggest materials using one of several forms. Find out about other library services? 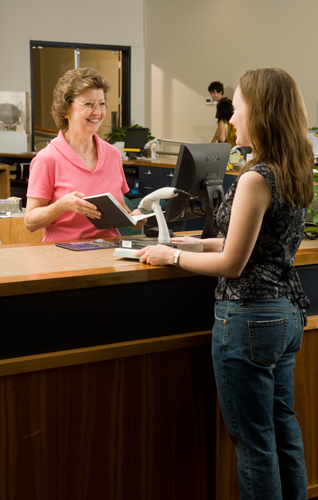 Check out the Library Services page or contact a librarian for questions or comments! View the AirMedia Instructions page for all of the details. Contact our DMC department, located in the lower level of the Library, at 336.256.1381 for assistance.